We have owned the 500GB Western Digital Passport for a while. We love it for its size (about the size of an iPhone) and portability. But, we are quickly filling it up and have been looking around for a 1TB external hard drive which we would just keep at home for backups. Small form factor wasn’t a consideration. Since we were happy with Western Digital, we were looking at the 1TB Western Digital MyBook but the price for it has stayed over $100 for a while. 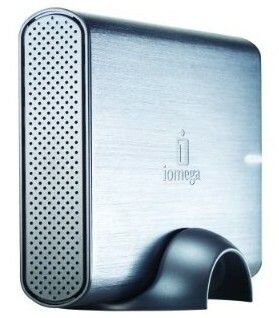 Until I came across Iomega Prestige 1 TB USB External Hard Drive . This beautiful external USB hard drive had great reviews on Amazon plus it has a 7200 rpm hard drive. Most $100 1TB drives featured only a 5400/5600 rpm drives. This morning though, Priya spotted a deal on Dell where they had IOmega Prestige 1TB drive for $74.99. It usually sells for $109.99 but Dell had a $35 instant savings – no mail in rebate, instant! (I had a $5 tax bringing the total to $79.99 for me). Plus, they offer a Free 2nd Business Day shipping! So we ordered one and I just wanted to share it with my readers who might be looking for a good external hard drive! Plus, this drive gets you a software license for Secure EMC Retrospect HD backup software and a 2GB Mozy Online backup account thrown in!